Ian and Stephen (and Mike) host an acoustic session at The White Horse Ditchling on the last Sunday of the month (except for Bank Holiday weekends when it’s on the Bank Holiday Monday) at 8pm. It's very likely that other members of Unreel or of the Twaggers - see below - will be there. Come and listen or join in. 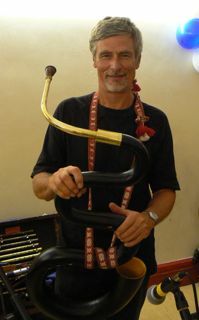 Ian’s own web site - he makes guitars, mandolins and similar instruments. Mike's alter ego on the internet is Will Fly, and his website is filled with hundreds of PDF pages of music, tablatures and chords - all free. 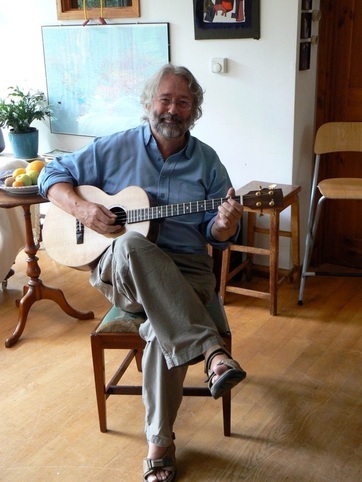 There are also almost 400 of his videos on YouTube - many of them instructional - in which he plays a variety of instruments including guitar, tenor guitar, mandolin, Appalachian dulcimer and piano. Mike also teams up regularly with Brighton guitar wizard Chris "Wolfie" Wolferstan to play a mix of ragtime, blues and 1930s jazz duets. As Will & Wolfie, they play in clubs and pubs in the Sussex area and beyond. As well as playing music, Mike helps fellow Sussex musician Stuart Reed to run the Brighton Acoustic Session, held at the Lord Nelson in Trafalgar Street, Brighton, on the first Monday of every month and now in its sixth year. Ian also plays in The Twagger Band with Will Duke, Joy and Derrick Hughes and Sue Evans. The picture shows them disporting themselves at the Royal Oak in Wineham, West Sussex, during a folk weekend. 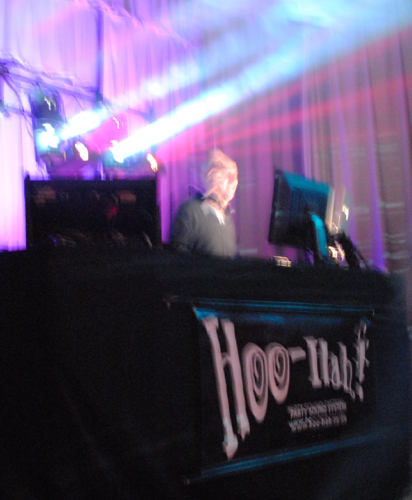 If you want a different kind of music, for example if you want a disco after your barn dance, Mal Smith runs The Hoo-Hah Party Sound System - sound system, light show and professional DJ. Hire a fantastic sound system, light show and professional DJ to liven up your party, wedding reception, celebration or event. No venue is too small or too large – we’ve played in living rooms and town halls, hotels and marquees, under the stars and even on wheels... With tens of thousands of tracks instantly available Hoo-Hah can make your joint jump. Mal and Alan are also the drummer and guitarist respectively in the noisy rock covers band The Overtones. 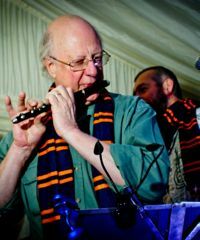 Barry Ruffell is a very accomplished musician who sits in with the band from time on those rare occasions when either Ian or Stephen can't make a particular engagement. Barry plays - in no particular order - guitar, flute, piccolo, violin, banjo, mandolin, nyckelharpa, trombone and other instruments. He and his good friend Ray Chandler, alias the Rude Mechanicals, play most Wednesday evenings at the Red Lion in Shoreham-by-Sea, in West Sussex. The Mechanicals often augmented by Mick Parker on piano accordion to form a trio, plus Jeremy Sherman when extra guitar sounds are needed. Their musical style is informal, their repertoire extensive and adaptable, and their playing and singing highly distinctive. Derrick Hughes is another very accomplished musician who occasionally sits in with Unreel. Derrick is more usually found heading the Twagger Band (of which Ian is also a member). Ian plays mainly guitar in the Twaggers, while Derrick plays a multiplicity of instruments including the Mighty Serpent. As well as Derrick and Ian, the Twagger membership includes Joy Lewis on hammered dulcimer, harp and guitar, Sue Evans on concertina and another hammered dulcimer, and Will Duke on concertina and manly vocals. Derrick also plays duets with Joy Lewis. Between them they play a wide variety of instruments including guitar, smallpipes, hammer dulcimer, bowed psaltery, concertina, harp, serpent and an ever-growing collection of recorders and whistles. They play at weddings, concerts, parties and other social gatherings and also provide musical talks and after-dinner entertainment for many different groups. Whatever the audience, the emphasis is always on entertainment with plenty of humour.